The Heermann's gull (Larus heermanni) is a gull resident in the United States, Mexico and extreme southwestern British Columbia, nearly all nesting on Isla Rasa in the Gulf of California. They are usually found near shores or well out to sea, very rarely inland. The species is named after Adolphus Lewis Heermann, nineteenth-century explorer and naturalist. This species looks distinctly different from other gulls. Adults have a medium gray body, blackish-gray wings and tail with white edges, and a red bill with a black tip. The head is dusky gray in non-breeding plumage and white in breeding plumage. Immatures resemble non-breeding adults but are darker and browner, and the bill is flesh-colored or pink till the second winter. A few birds, no more than 1 in 200, have white primary coverts, which form a showy spot on the upper wing. 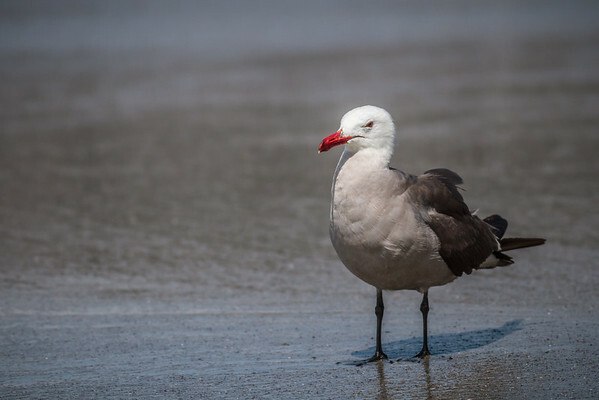 This gull is unlikely to be confused with other species as it is the only white-headed, gray-bodied gull found on the west coast of North America. Calls are described as deep and similar in pattern to other gulls but noticeably different in quality.